Dante Gabriel Rossetti (1828–1882), Veronica Veronese (1872), oil on canvas, 109.2 × 88.9 cm, Delaware Art Museum, Wilmington, DE (Samuel and Mary R. Bancroft Memorial, 1935). Courtesy of Delaware Art Museum, via Wikimedia Commons. There was a lot happening in European painting in the middle and late nineteenth century, from about 1840 onwards. General accounts focus on France, but there were just as major changes happening in Germany, Italy, Britain, and the rest of Europe too. With the simplification enforced by major textbooks of art history, accounts of painting in Britain run something like: Constable, Turner, Pre-Raphaelite, then the twentieth century. From about 1860, nothing interesting seems to have happened, maybe it was all just ‘academic’, or various iterations on a Pre-Raphaelite theme. This article is part of a series in which I try to get better insight into how non-impressionist painting changed from 1840 to 1900, mainly that in Britain. 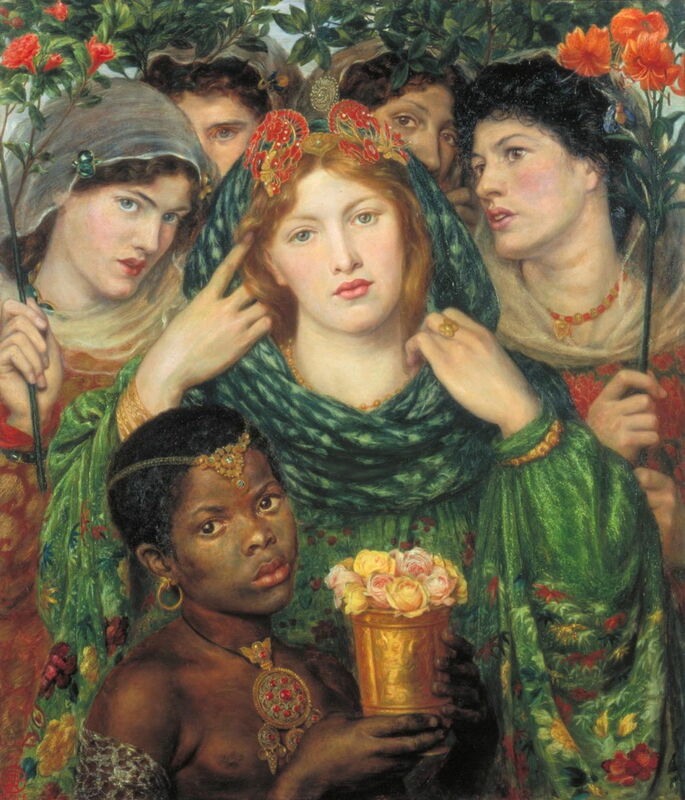 Here I will take one of the most prominent and radical painters, Dante Gabriel Rossetti (1828-1882), and trace changes across just half a dozen of his more important paintings, to try to get some clearer insight. Subsequent articles will look at his contemporaries. The Pre-Raphaelite Brotherhood (PRB), the closed group which formed the initial kernel of the whole movement, was established in 1848, and lasted barely five years to 1853. Its founding concept was that art (painting, in particular) since the time of Raphael had become misguided, and had abandoned the ‘simple honesty’ which had prevailed in the fifteenth century (1400s) and before. The aim was therefore to become true to nature again. This was primarily a revolt against the many artificialities which had arisen in composition, reaching a peak, they felt, in the work and teaching of Sir Joshua Reynolds. This did not make the Pre-Raphaelites strict realists, who could only paint what they saw. Indeed, many of their paintings feature the elaborate use of symbols, which were sometimes explained in accompanying text, and required decoding in order to ‘read’ the painting – and Pre-Raphaelite paintings almost invariably require careful and detailed reading, sometimes at multiple levels. 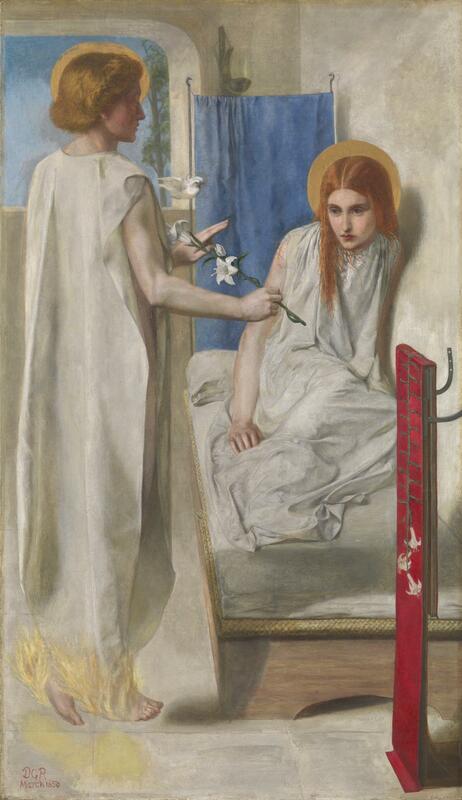 Two of Rossetti’s early oil paintings are good examples of this strictly Pre-Raphaelite art. The Girlhood of Mary Virgin (1848–9) contains some archaic devices, such as the gilt and lettered halos, and an oddly-proportioned angel, but shows what Rossetti envisaged might have been the pictorial reality of the Virgin Mary during her youth. She works on embroidery with her mother, Saint Anne, while her father, Saint Joachim, prunes a vine. Those details are shown quite realistically, as are the abundance of symbolic objects. The latter include palm fronds on the floor (the Passion), a thorny briar rose (Christ’s suffering and death), lilies (purity), books (labelled with faith, hope, charity, fortitude, etc. ), a dove (the Holy Spirit, the Annunciation), red cloth (the Passion), crosses in trellis (crucifixion), and more. Ecce Ancilla Domini! 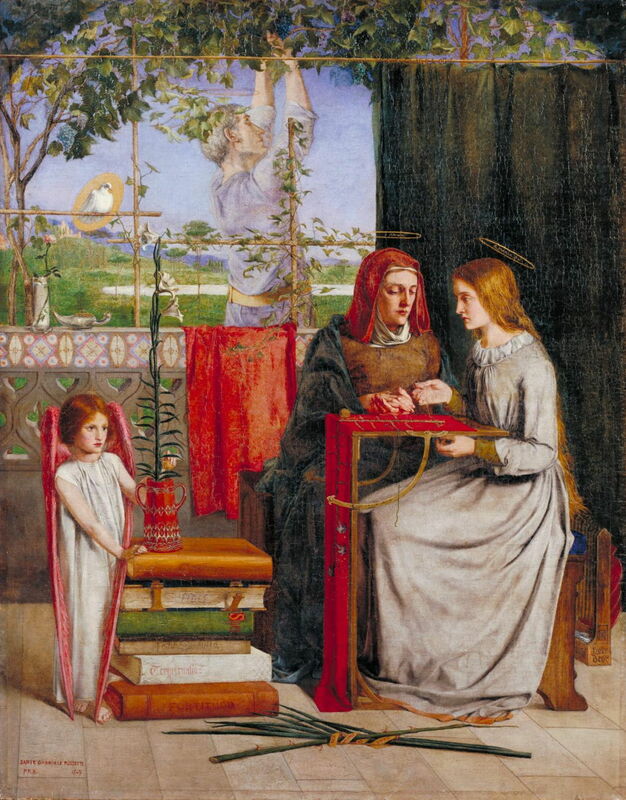 (The Annunciation) (1849–50) is as radical a reinterpretation of the traditional Annunciation painting, as The Girlhood of Mary Virgin was of the life of the Virgin. There are gilt halos again, amid very natural realistic depictions of the figures and objects. Symbols shown include: white robes (purity), lily (purity, a traditional Annunciation symbol), a dove (the Holy Spirit), red embroidery (Christ’s crucifixion), blue curtain (heaven), and flames at the feet of the Angel Gabriel rather than traditional wings. Both of these paintings match the profile of the strict Pre-Raphaelite. Less than a decade later, though, Rossetti painted a work which was completely different in almost every respect from those early works: Bocca Baciata (1859). Dante Gabriel Rossetti (1828–1882), Bocca Baciata (1859), oil on panel, 32.1 x 27.0 cm, Museum of Fine Arts, Boston, MA. Wikimedia Commons. The mouth that has been kissed does not lose its promise, indeed it renews itself just as the moon does. by which he referred to imported pornographic prints. Dante Gabriel Rossetti (1828–1882), The Blue Bower (1865), oil on canvas, 84 × 70.9 cm, Barber Institute of Fine Arts, Birmingham, England. Wikimedia Commons. Fanny Cornforth appears again in The Blue Bower (1865), a step even further from the PRB. Her eyes now directed at the viewer, her hair is still loose and her clothing open and inviting. 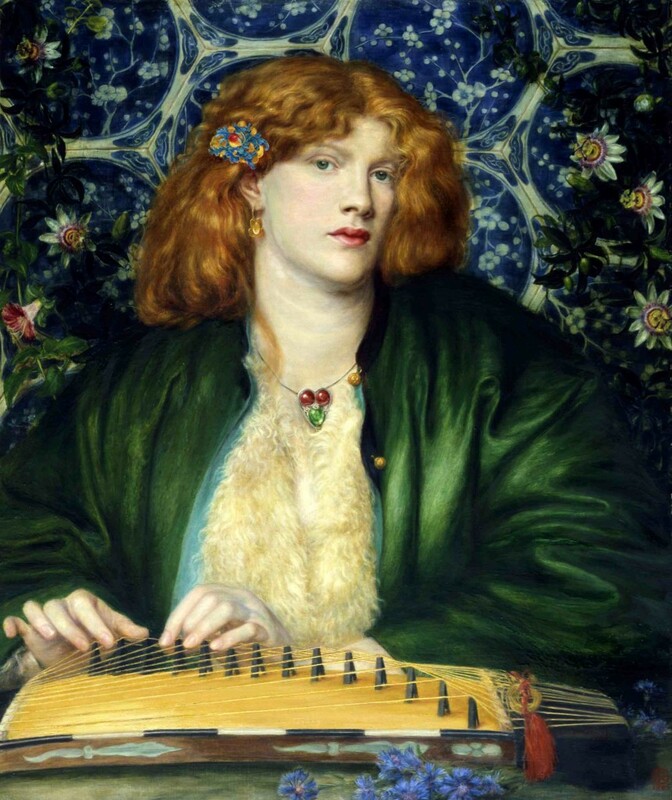 Her hands are idly caressing the strings of an instrument which is exotic and oriental: Rossetti probably did not know, but it is a Korean koto, and refers to another sense (hearing) and mode of art (music). Cornforth is surrounded by passion flowers, the decorative blue background alluding to their heavy scent, and the sense of smell. The delicate light blue cornflowers in the foreground are probably just a visual pun on Fanny’s surname. The bride in the centre, modelled on Marie Ford, wears an intricate leather headdress from Peru and a Japanese kimono, although the latter is wrapped around her in an idiosyncratic manner rather than being worn as the Japanese garment would have been. Her attendants crowd around her, making the composition very shallow, and adding exotic touches in their skin colours and appearance. Its symbols are few and simple: roses (love) being offered up by the boy in the front, and red lilies (passion, physical love). Rossetti’s later Veronica Veronese (1872) returns to the musical theme of The Blue Bower. Commissioned by Frederick Leyland, a shipping magnate from Liverpool, it was destined for his collection of Rossetti’s images of women in the drawing room of his Kensington, London, residence. Its title refers to the Venetian Master Veronese, who together with Titian was now a greater influence on Rossetti than those prior to Raphael. Rossetti also felt that the name sounded like some sort of musical genius. 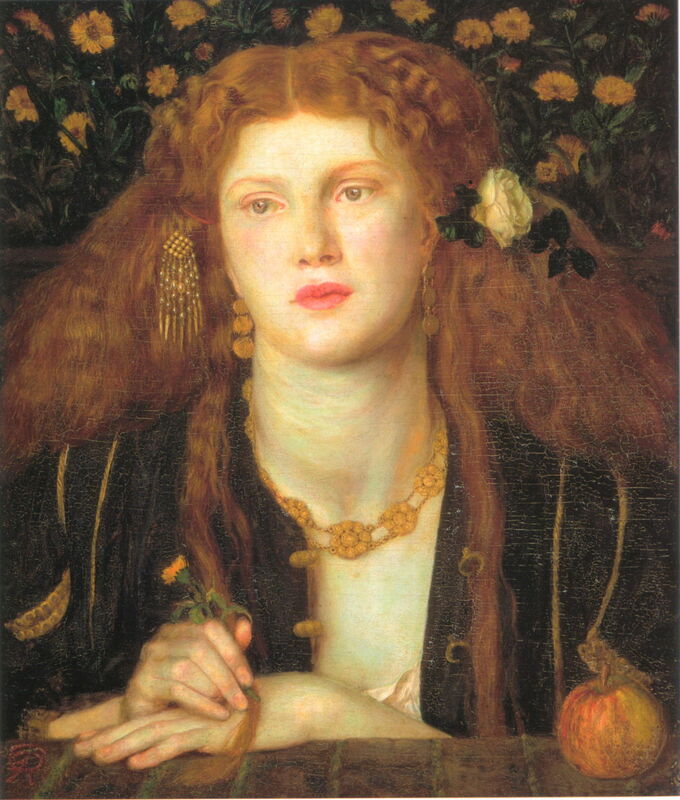 His model was the beautiful Alexa Wilding, who became Rossetti’s obsession after they met in 1868. She sits, daydreaming languidly, her hands playing idly with a violin which hangs on the wall in front of her. She has been writing a musical score, which is under her right forearm. Although her body leans slightly forward, her head is tilted back, and her face turned. Behind her, a yellow canary is perched on the door of its cage and singing, its voice inspiring Veronica’s thoughts. The window behind is covered in thick dark green drapes, and Veronica wears a full dark green dress. Rossetti had changed his art, to the production of idealised sensual images of women, singly or in groups. These new paintings have elements of (weak) narrative, literary illustration, and portraiture, but do not fit any one of those genres. The best fit for those works is that of the Aesthetic ‘movement’, or Aestheticism, which was developing during the 1860s. Among its architects was Walter Pater, who claimed that “all art constantly aspires towards the condition of music”, in its abstraction, lack of narrative or ‘meaning’, and capability of generating powerful emotions in the listener. 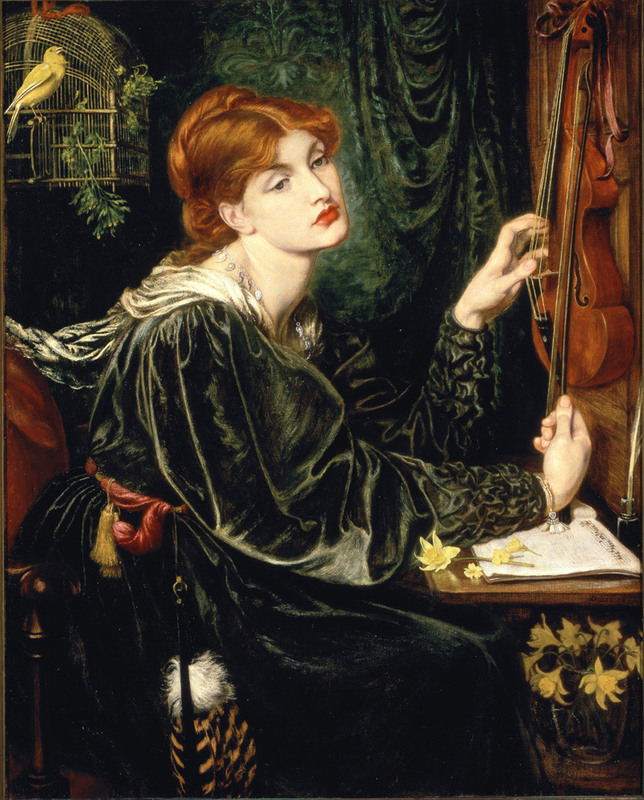 Although some of his claim is debatable with respect to painting in general, and Rossetti’s later paintings in particular, it does fit well in many respects: allusions to non-visual sensation and other artistic modes/media, shallowness in reading and meaning, and overt sensuality, for instance. Failing to draw a distinction between Rossetti’s early PRB paintings and these later works would surely be a fairly gross error. Posted in General, Painting and tagged Aestheticism, history of painting, Hunt, japonisme, painting, Pater, PRB, Pre-Raphaelite, Rossetti, Titian, Veronese. Bookmark the permalink.